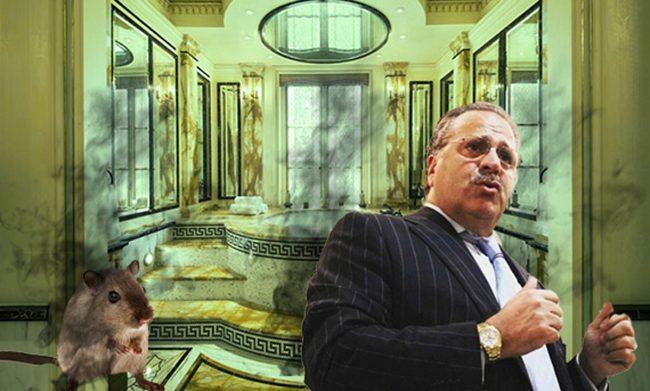 Once home to the late fashion designer Gianni Versace, an opulent Upper East Side townhouse was rented to developer Joseph Chetrit, who says it was plagued by a miasma of blocked sewage and a “raging” rodent infestation. Chetrit agreed to rent 5 East 64th Street, a six-story townhouse owned by hedge fund billionaire Thomas Sandell, in August 2016 for $65,000 a month, according to a lawsuit filed in state Supreme Court on Wednesday. Chetrit and his wife, Nancy, gradually realized that the home — marketed as having “the proportions of an embassy” — was overrun by rats, “pervasive plumbing problems” and mold, according to the complaint. Sandell purchased the home in 2005 for $30 million and began marketing it to renters for $100,000 a month in July 2016, according to StreetEasy. Chetrit’s lease — at $35,000 less per month — is scheduled to end August 31, 2018. The lawsuit accuses Sandell of hiding the home’s various issues from Chetrit. “The conditions have been atrocious,” said Stephen Meister, an attorney for Chetrit. He noted that he hopes the issue can be resolved amicably. The lawsuit describes a clash between luxury and squalor: Rats running past guests at a dinner party in the formal dining room, and housekeepers discovering rat droppings in the “breakfast room.” Chetrit alleges he found dead rats in various rooms of the home (including the “maids quarters”), along with droppings and urine throughout. According to the complaint, the patio/garden area of the home was unusable due to the rodent infestation. The developer complained to Sandell but ended up hiring his own exterminator when the landlord didn’t take care of the issue, according to the lawsuit. The couple’s woes seemingly didn’t end with dead rats. The Chetrits noticed a “foul odor” upstairs — which they initially thought was due to deceased rats trapped in the walls. The smell was actually caused by breaks in the aging plumbing pipes, according to the lawsuit. Though Sandell hired contractors, Chetrit claims they failed to properly solve the plumbing issues, leading to subsequent leaking and mold growth. The work was also disruptive, and the Chetrits weren’t properly warned of how long workers would be in the house, according to the lawsuit. On Nov. 14, 2017, a plumber removed 10 gallons of sewage from the home’s plumbing lines, according to the complaint. Nancy Chetrit emailed Sandell’s hedgefund — Sandell Asset Management — which was coordinating the work. “…as you can image, the house smells like a sewer … I am obviously in a state of no return!!! …” she said in the email, according to the complaint. According to the lawsuit, workers also move “millions of dollars’ worth” of the Chetrits’ belongings without permission. Chetrit is seeking at least $1 million in damages, in addition to rent credit for times when parts of the home were unusable, due to ongoing work and/or rat invasions. The lawsuit also seeks to force Sandell to provide reports on the home’s air quality to determine if the Chetrits were exposed to hazardous mold while living there.